Mucocele of the appendix is abnormal dilatation of the appendix usually occurs following obstruction, secondary to inflammatory processes. Very rarely, it occurs secondary to neoplasms such as cystadenoma or cystadenocarcinoma. Here, we are report two cases of mucocele of the appendix, one each due to cystadenoma and cystadenocarcinoma. A 60-year-old male patient presented with recurrent abdominal discomfort for 1 year with no history of abdominal pain, fever, vomiting, and melena. Bladder and bowel habits were normal. Physical examination revealed a firm, nontender, ill-defined and immobile mass of 8 cm × 6 cm size in the right iliac fossa. There was no hepatosplenomegaly. Digital rectal examination was normal. Routine laboratory investigations were normal, and contrast-enhanced computed tomography [Figure 1] (CECT) abdomen showed an elongated nonenhancing thick walled fluid density lesion of 12 cm × 6 cm size with focal calcifications involving retrocecal aspect in the right iliac fossa not separately seen from appendix, suggestive of mucocele of the appendix. Carcinoembryonic antigen (CEA) was normal. With the diagnosis of mucocele of the appendix, the patient was taken up for surgery. On laparotomy, there was a large cystic mass in retrocecal region displacing cecum upward and medially and base of the appendix was identified between cecum and cyst. There was no free fluid in peritoneal cavity and rest of the abdominal organs were normal. Right hemicolectomy with omentectomy was carried out en bloc with cyst [Figure 2]. On gross examination, specimen showed thick-walled cyst of 12 cm × 6 cm which was continuous with base of the appendix. Cut section revealed mucous material with mural nodules as shown in [Figure 3]. Histologically cyst was composed of mucin-secreting columnar epithelium and appendiceal mucosa was replaced by neoplastic cells. Final diagnosis of mucinous cystadenocarcinoma of appendix was made. Postoperative period was uneventful. A 55-year-old male patient presented with recurrent abdominal pain for 1 month associated with pain and vomiting initially. Physical examination revealed an ill-defined firm mass in the right iliac fossa. Digital rectal examination was normal. Routine laboratory investigations were normal. CECT abdomen showed an ill-defined hypodense lesion of size10 cm × 8 cm with thin wall with maximum thickness up to 1 cm involving appendix in the right iliac fossa with free base suggestive of mucocele of the appendix. Rest of the abdominal organs were normal. On laparotomy, there was 10 cm × 6 cm cyst arising from appendix with palpable mass 2 cm away from base as shown in [Figure 4]; hence, appendicectomy alone was done. On gross examination, there was cystically dilated appendix measuring 11 cm × 6 cm with congested blood vessels. Cut section revealed yellowish mucous material from lumen with 1 cm normal base. 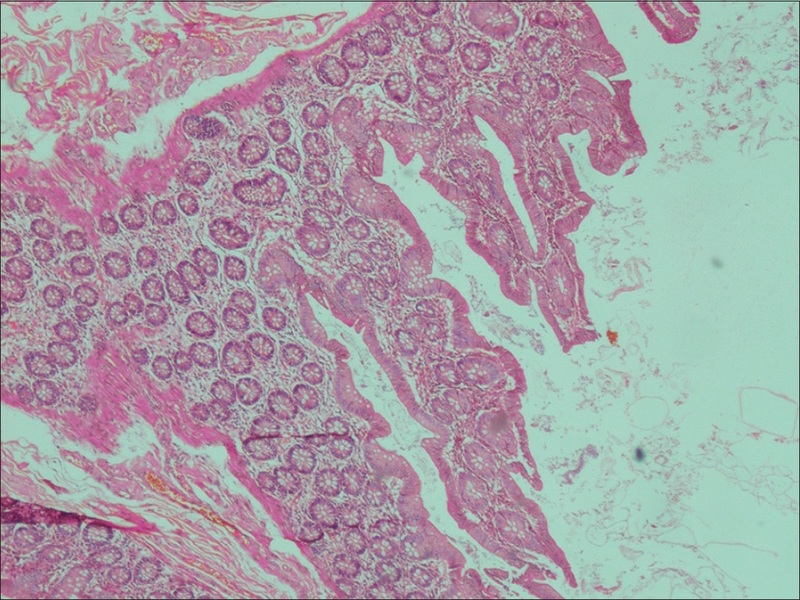 Histologically, there was proliferative mucinous epithelium arranged in papillary folds with normal serosa and base of appendix suggestive of mucinous cystadenoma of appendix, as shown in [Figure 5]. Postoperative period was uneventful. Preoperative diagnosis of appendicular mucocele is very important for appropriate management., Ultrasonography (USG), computed tomography (CT), and colonoscopy are the modalities of investigations, used for diagnostics. USG can be used as primary diagnostic modality to differentiate between mucocele and acute appendicitis. CT is considered as the most accurate method to identify mucocele. CT features are appendix lumen more than 1.3 cm, its cystic dilatation and wall calcification are pathognomonic of mucocele of appendix.,,,, Colonoscopy usually shows yellowish mucous discharge from the orifice of the appendix with elevation of its ostium which is described as Volcano sign.,, Besides, colonoscopy also helps to rule out synchronous and metachronous tumors of colon. Preoperative CEA level serves as surrogate marker of malignancy in the appendix or in the colon. It is important to excise intact mucocele because a perforated or ruptured mucocele can cause a grave complication of pseudomyxoma peritonei. Once this complication occurs, treatment is difficult and outcome is quite unsatisfactory. Hence, early diagnosis and timely surgical intervention is mandatory. Although most surgeons prefer open method, laparoscopic approach is also practiced. However, it needs to be done with caution taking care to prevent rupture or spillage.,,, It is also important to inspect all sites where mucinous tumors are common. Whether there are positive lymph nodes of mesoappendix and ileocolic. Depending on the stage, the surgical procedure varies from appendectomy to the right colectomy, including cytoreductive surgery, heated intraoperative intraperitoneal chemotherapy, and early postoperative intraperitoneal chemotherapy. In our series, case one was having intact large mucocele in which base was involved and adherent to cecum; hence, right hemicolectomy was performed. In case two, the mucocele was not perforated, there was no pathologic process in the base of the appendix, and the regional lymph nodes were negative; hence, only appendectomy was performed. Histopathological results justify the surgical procedures, carried out in both cases. Acute appendicitis is a very common problem; one has to be vigilant in an adult to identify appendiceal mucocele, although it is a rare disease. A preoperative detection and appropriate investigations are essential in the proper management of mucocele of the appendix. Rokitansky CF. A Manual of Pathological Anatomy. Vol. 2. Philadelphia: Blanchard & Lea; 1855. Rangarajan M, Palanivelu C, Kavalakat AJ, Parthasarathi R. Laparoscopic appendectomy for mucocele of the appendix: Report of 8 cases. Indian J Gastroenterol 2006;25:256-7. Marudanayagam R, Williams GT, Rees BI. Review of the pathological results of 2660 appendicectomy specimens. J Gastroenterol 2006;41:745-9. Ruiz-Tovar J, Teruel DG, Castiñeiras VM, Dehesa AS, Quindós PL, Molina EM, et al. Mucocele of the appendix. World J Surg 2007;31:542-8. Smeenk RM, van Velthuysen ML, Verwaal VJ, Zoetmulder FA. Appendiceal neoplasms and pseudomyxoma peritonei: A population based study. Eur J Surg Oncol 2008;34:196-201. Aho AJ, Heinonen R, Laurén P. Benign and malignant mucocele of the appendix. Histological types and prognosis. Acta Chir Scand 1973;139:392-400. Higa E, Rosai J, Pizzimbono CA, Wise L. Mucosal hyperplasia, mucinous cystadenoma, and mucinous cystadenocarcinoma of the appendix. A re-evaluation of appendiceal “mucocele”. Cancer 1973;32:1525-41. Sugarbaker PH. Appendiceal epithelial neoplasms and pseudomyxoma peritonei, a distinct clinical entity with distinct treatments. In: Bland KJ, Buchler MW, Csendes A, Garden OY, Saar MG, Wong J, editors. General Surgery. Principles and International Practice. London: Springer, Limited; 2009. p. 885-93. García Lozano A, Vázquez Tarrago A, Castro García C, Richart Aznar J, Gómez Abril S, Martínez Abad M, et al. Mucocele of the appendix: Presentation of 31 cases. Cir Esp 2010;87:108-12. Dhage-Ivatury S, Sugarbaker PH. Update on the surgical approach to mucocele of the appendix. J Am Coll Surg 2006;202:680-4. Lien WC, Huang SP, Chi CL, Liu KL, Lin MT, Lai TI, et al. Appendiceal outer diameter as an indicator for differentiating appendiceal mucocele from appendicitis. Am J Emerg Med 2006;24:801-5. Pickhardt PJ, Levy AD, Rohrmann CA Jr., Kende AI. Primary neoplasms of the appendix manifesting as acute appendicitis: CT findings with pathologic comparison. Radiology 2002;224:775-81. Karakaya K, Barut F, Emre AU, Ucan HB, Cakmak GK, Irkorucu O, et al. Appendiceal mucocele: Case reports and review of current literature. World J Gastroenterol 2008;14:2280-3. Francica G, Lapiccirella G, Giardiello C, Scarano F, Angelone G, De Marino F, et al. Giant mucocele of the appendix: Clinical and imaging findings in 3 cases. J Ultrasound Med 2006;25:643-8. 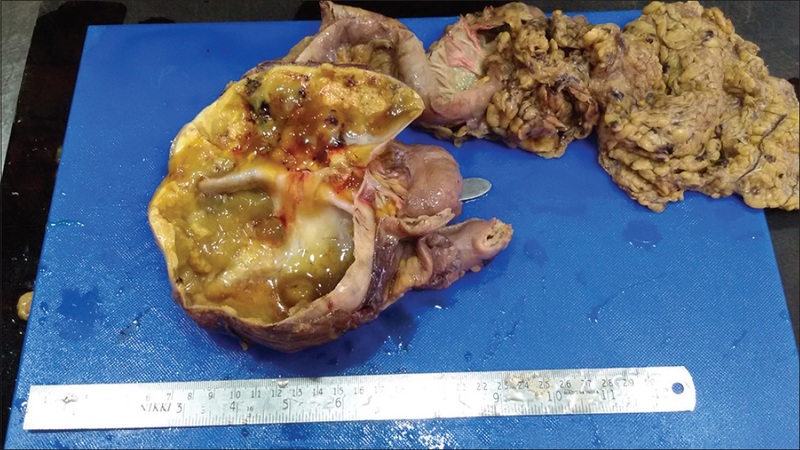 Khan MR, Ahmed R, Saleem T. Intricacies in the surgical management of appendiceal mucinous cystadenoma: A case report and review of the literature. J Med Case Rep 2010;4:129.